It is our policy to conduct all business activities in a responsible manner free from recognized hazards; to respect the health and safety of our employees, customers, suppliers, partners and community neighbors; and to go beyond mere compliance with all applicable health and safety laws and regulations, striving for continuous improvement. 1. Maintaining an alcohol and drug free workplace though the implementation of an alcohol a drug policy. 2. Developing safety rules and guidelines that are based on applicable OSHA standards and safe work practices. 3. Implementing and conducting safety education and training programs. 4. Conducting safety inspections to identify potential hazards and injury sources. 5. Investigating accidents to determine the causes and actions required to prevent recurrence. 6. Utilizing a return to work policy to provide support and alternate duty assignments for employees who may be injured on the job. It is the responsibility of all Sapona employees to make safety a daily priority to adhere all safety and health rules and policies. Failure to adhere to applicable safety and health rules and policies may result in disciplinary action up to and including termination. 1. Always report any injury, even a small cut or scratch, to your supervisor immediately! 2. If outside Medical Attention is required for a work-related injury, the worker will seek treatment from Hope Center Family Medicine at 300 Mack Rd, Asheboro, NC. After hours, treatment is available at First Care or Randolph Hospital. 3. Be alert to fire and safety hazards. Report them immediately. In the event of a fire, only trained workers are expected to put out small fires. For all other workers, attempting to put out a fire is a voluntary task and not a requirement. In the event of a large fire, use the RACE method (see emergency fire procedure). When evacuating the building, gather around the light pole in the grassy area between the plant and plumbing store. 4. Smoking is allowed outside the building in designated areas only. 5. Cooking is allowed in the break room vending area only. 6. Know the location of Safety Data Sheets (SDS Index available on database). Keep all chemicals properly labeled and stored. 7. Keep your work area free and clear of trash and litter. Clean up pellets, water and oil on floor. 8. Keep aisles clear and free of debris and other safety hazards. Keep exits clear. 9. Do not leave pallets on end. Do not stack higher than 6 ft. or closer than 10 ft. to building. 10. Do not store items directly in front of electrical panels. Keep electrical cabinets closed. 11. No permanent use of extension cords is allowed. Use only grounded cords. 12. Electrical equipment must be grounded (3-wire) or double insulated if not low voltage/low amperage. 13. Never use spliced cords, frayed cords, damaged insulation, reversed polarity, missing prong or broken plugs. 14. Use only GFCI protected circuits when using electrical devices around water. 15. Keep work area and walkways clear of electrical cords. 16. Electrical maintenance work on energized equipment is limited to qualified and trained personnel working under very limited circumstances and requires appropriate personal protective apparel. 17. Watch where you walk. Report tripping hazards, faulty equipment, or other unsafe conditions or practices to your supervisor. 18. Do not run or indulge in horseplay. 19. Always lift a heavy load with your leg muscles, not your back muscles. More importantly get help if needed. 20. Be alert and notify your supervisor of muscle, joint, or nerve pain due to job ergonomics. Avoid awkward positions, excessive motions, uncomfortable equipment and extreme force. 21. When required only use a ladder that is in proper working order; do not use chairs, boxes, etc. Keep area at base of ladders clear. 22. Do not climb outside of any platform railings. Do not climb on a machine or work at a level above 4 feet without either railings or a full body harness fall arrest system. 23. Use hand tools carefully, and only those in good condition. Cut resistant gloves are available for use when trimming. 24. Do not operate any machinery until you have been instructed in its use. Use caution around high speed moving parts. 25. Always keep the safety of others in mind, as well as your own. Handle tools and machinery cautiously and watch out for other workers. Act in a safe manner. 26. Do not attempt to adjust, repair or lubricate any machinery unless you are instructed and authorized to do so. See lockout/tagout procedures. 27. All safety guards, shields, labels, and devices must be kept in place on machines. Do not tamper with or reach around. 28. Any safety devices that are not functioning properly must be reported to your supervisor immediately. 29. Long hair and loose clothing must be securely tied back when working around moving machinery. 30. 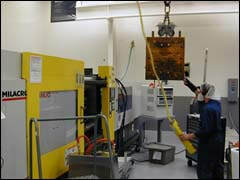 Hearing protection is required to be worn at all times in manufacturing areas. 31. Eye protection is required in manufacturing areas, except walking in aisle to/from the punch clock, and break area. 32. No open toe shoes are allowed and soles must be non-slip. 33. Do not touch hot molten plastic to avoid severe burn potential. Only authorized, trained workers are allowed to purge plastic from the machines and heavy-duty gloves are provided and must be used to prevent burns. 34. Never look at a welding arc or flame without suitable goggles. Obtain hot work permit before using a torch or welder. 35. Do not operate forklifts unless you are instructed, licensed and authorized to do so. Use extreme caution and follow established rules when operating forklifts. Wearing seatbelt is required if forklift is so equipped. No passengers! 36. Truck wheels must be chocked before engaging dock leveler. Truck drivers are not to pull away with dock leveler engaged. 37. Lift devices must be operated with extreme caution. Only workers with forklift training are allowed to use raised platform lift (scissor lift or cage on forklift). Do not move platform lift with a person when lift is in raised position. 38. Always use a safety nozzle when using compressed air. Do not use compressed air to clean your clothing or that of anyone else. 39. Do not enter confined spaces unless you are instructed and authorized to do so. See permit required confined space program. 40. Observe safe driving practices and all traffic laws while on company business or premises. The company assumes no liability for any fine imposed on you for personal violations. Wear your seatbelt when driving. Workers are required to maintain satisfactory insurance when operating personal vehicles on company business. 41. Know and observe all work specific safety rules. 42. Safety rules are for your own protection. Violations could lead to serious injury to you and to others and will be the cause for disciplinary action up to and including termination. These safety regulations are subject to change. The absence from this list of any approved safety rules does not prevent them from being part of our Safety Program. 43. 1 rest day every 7 days is required for all workers. 44. See safety procedures for more details. Sapona Plastics has developed a forklift training video and test program to ensure properly trained and licensed operators.